“In the Spirit of Holy Week”: Veneer Is Not Enough. One of the downsides of Twitter is its immediacy. If one is not careful, one can toss off a tweet that comes back to haunt in full force. One problem with Ingraham’s tweet is that it is inaccurate: Hogg was not whining. I watched Hogg’s interview with TMZ, the video upon which the article Ingraham tweeted is based. Hogg was certainly not whining; he was merely answering questions posed to him by a TMZ reporter. There is nothing in his expression or voice tone that indicates whining. Reporter: Are you a little surprised that schools haven’t solicited you because, beyond having a 4.2 grade point average, you are doing important things? Hogg: I’m not surprised at all, in all honesty. I think there’s a lot of amazing people that don’t get into college, not only that do things like I do, but because their voices just aren’t heard in the tsunami of people that apply every year to colleges. And in such an economic, uh, such an impacted system that we have here in America, who have to go into massive amounts of debt just to go to college and get an education. I think it’s really sad, but it’s the truth. Reporter: It must be a little disappointing given that you have to go through this kind of trauma; you’ve picked yourself up, and you’ve created a movement that has really resonated around the world. Hogg: It is. It is absolutely disappointing, but at this point, we’re already changing the world. If colleges want to support us in that, great. If they don’t, it doesn’t matter. We’re still going to change the world. However, even if Hogg were “whining,” as Ingraham chose to write, in selecting such a term, Ingraham exhibits a thinly-veiled disdain for a teenager who continues to process a profoundly traumatic event that transpired six weeks ago in a powerful way that does indeed have America’s attention. There’s Ingraham’s real problem: At best, Ingraham’s “whining” tweet was in poor taste. At worst, it betrays a stunning callousness of spirit. Given that Hogg was able to direct attention to Ingraham’s financial supporters, who continue to drop her show, Ingraham is paying for that tweet. To Christians, the Spirit of Holy Week is the spirit of Christ, which should pervade the life of the Christian. In practical terms, this means that there should be a bottom line of dignity in responding to those with whom we disagree, if for no other reason than out of gratitude for Christ’s death for me, including all of my faults. If one tries to confine the spirit of Holy Week to that week, what emerges is not the love, joy, peace, patience, kindness, goodness, gentleness, humility, faithfulness, and self-control that evidence one’s acute awareness of Christ’s love, but instead a religious veneer easily exposed for what it is when it takes a hefty brush with reality. Certainly Ingraham’s continued loss of sponsors is that hefty brush. Words matter. But what matters more is the heart condition behind the words. 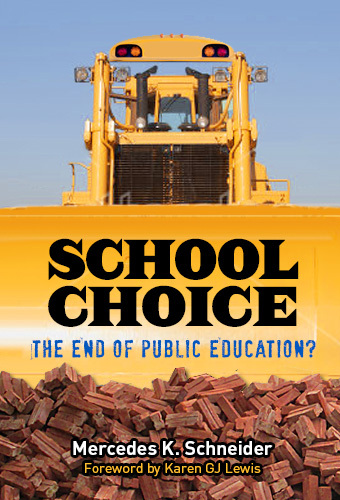 Want to read about the history of charter schools and vouchers? 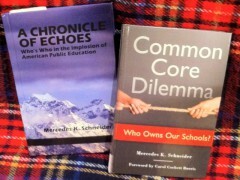 Schneider is a southern Louisiana native, career teacher, trained researcher, and author of two other books: A Chronicle of Echoes: Who’s Who In the Implosion of American Public Education and Common Core Dilemma: Who Owns Our Schools?. You should buy these books. They’re great. No, really. From → Heads up: It's Political! Happy Easter to you, Mercedes, whose faith is solid through and through; not merely veneer. Thanks you for lifting up a young man who has been targeted for objecting to nearly being killed. Beautiful description of the spirit of Holy Week. I agree, we should strive to live in that spirit all year long. Laura Ingram should never have brought it up . Sounded phony from the minute I read it. Thank you. A post of no small importance. You’re right, Mercedes. It’s the “… heart condition behind the words.” If we could align the two (like you point out), more would hear and listen to the Love becoming the front. No matter what our position in society, the least we can be is kind when describing or commenting on another’s life. David may make a lot of mistakes, but he is at least standing up for what he believes in and he is moving forward. I applaud him even if I don’t agree with him all of the time! « Louisiana’s 2017 NAEP Scores Must Not Be Pretty: John White Writes to NCES Prior to 2017 NAEP Release.